Latitude 43.526901. Longitude 5.449895. About midway along the tree-lined Avenue Cours Mirabeau at the corner of the Rue Clemenceau in the town of Aix-en-Provence, dept of Bouches-du-Rhone, France, stands the now famous hot thermal fountain and spring The Mousse Fountain, which is also known as ‘La Fontaine Deau Chaude’ and ‘Fontaine sur le Cours Mirabeau’. There are three other famous fountains close by: Fontaine de la Rotonde (19th century) in the Place de General de Gaul at the west end of the avenue is probably the largest, while Fontaine of the Nine Cannons (17th century) stands halfway between the two, while at the eastern end is the 19th century Fontaine du Roy Rene, but there are other fountains in the town. The seaport of Marseilles is approx 20 miles to the south and Pertuis is 10 miles to the north on the E712 highway. 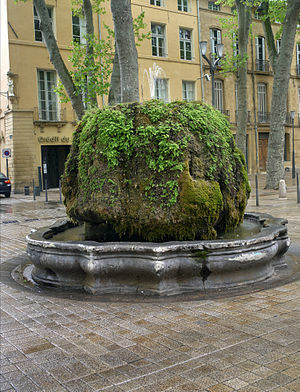 The Mousse Fountain is a naturally-formed thermal spring with its source at nearby Bagniers from where it travels deep underground to “spring-up” on the Avenue Cours Mirabeau in Aix-on-Provence. But the fountain’s shaped basin dates from more recent times – 1734 to be precise. The huge round boulder sits in the basin and is covered in moss and foliage – this probably dates from the dawn of time in geological terms. From this the fairly hot, steaming water issues through various orafices from which people can drink the water; whereas people with certain “diverse ailments” can use the water in the basin. The hot water here can, apparently, cure all manner of ailments such as nervous disorders, stomach disorders, rheumatism and some gynaecological conditions, but the water is quite hot and is known to reach a temperature of 94 farenhite or more. Sometimes a strange thick foam gathers on top of the water and is locally referred to as “mousse”, from which the name is derived, though this is said not to be in any way harmful to humans. The Romans under Gaius Sextius made good use of the hot thermal springs when they invaded this part of Gaul back in 121 BC after driving out the Celtic-Ligurian tribe from their settlement at Etremont just north of the town – the town at that time being on the Via Aurelia which linked northern Spain with Gaul. In the medieval period the thermal springs were a great potential for the town with pilgrims coming from all over the country to partake of the healing waters and, in more recent times this has largerly continued, mainly because Aix-en-Provence became a thermal spa-town, with hot water baths (giving a water temperature of upto 97 farenhite) that were built upon Roman foundations on the Rue du Bon Pasteur and, which again are said to be very effective for numerous diseases and bodily disorders. Categories: Holy Wells / Springs, The Mousse Fountain At Aix-En-Provence In France | Tags: The Mousse Fountain At Aix-En-Provence In France | Permalink.